Late in January I received a call from our HR department, informing me that I had gotten the position. I took the rest of the day off to celebrate my finally finding an entrance into an industry I had long wished to work in, and I didn't have to take a pay cut (ie: part time work, etc) in order to do so. I started in that position on February 19th. They gave me a rather nice laptop and a "Smart" phone. It didn't take me long to get used to working in the environment, and learning things like network infrastructure and company policy on certain things. It was certainly a wonderful change of pace. I'd have to say the best part of this new position was being able to get my hands on the latest software and technology. I was able to use Windows Vista within a month of it's official release, amongst other learning opportunities that I would not have been afforded before (and indeed had not been.) For example, I had never worked with Active Directory, the core of windows server networking since Windows 2000 Server first hit the scene. At ITT, our curriculum was apparently dated even as we used it, as most of my training for server based networking was on Windows NT 4 Server, which is similar, yet quite different (don't ask.) At least I did have a good understanding of UNIX/Linux thanks to ITT, as Cook's entire production system utilized lots of Linux. I worked this position all of this year. Working throughout the facilities of Cook put my face in front of a couple hundred people who often recognized me as "the computer guy" (seems I don't often remember to introduce myself when I'm in the mindset of working on a problem!) These folks began to occasionally ask if I worked on equipment outside the company as a side business. I often agreed to diagnose and/or fix their PC issues for a fee. This brought to mind the idea that perhaps BRS isn't a lost cause like I had nearly declared it early in the year. I had built a nice, slightly updated version of "The Backwood Realm" in the late winter and early spring, but then some of the guys at work showed me some other web solutions that began to help me wrap my head around using databases (SQL, etc) and scripting to crate dynamic, interactive web sites. Prior to this it had been kind of an overwhelming undertaking for me. 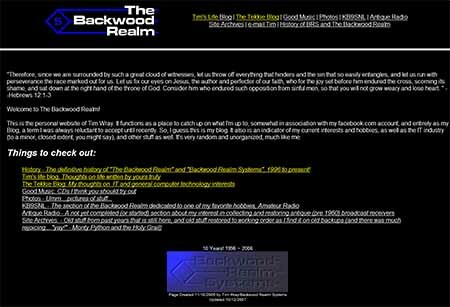 The BWR version 5, still my personal page, no longer the front page of backwoodrealm.com. 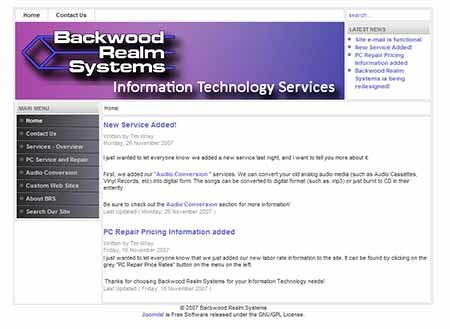 Using this knowledge, I launched the new BRS business site late in the year (November) and moved "The Backwood Realm" to secondary status as my personal web site at home.backwoodrealm.com. As if getting the position at Cook wasn't enough, the HR guy (who I know personally from church) at Bedford Machine and Tool talked me into sending him my resume, as they were considering bringing on an IT person to care for and advance their overall infrastructure. I doubted they'd top what I had financially and benefit-wise at Cook, but after a short interview, it not only started to look interesting, but fun and challenging as well. In December, just before Christmas, I was offered said position. I chose to take it. I started there on January 2nd, 2008. It was a great thing to begin my journey into my career in IT, even if it seemed to come 5 years too late for my personal preference. Nevertheless, it did arrive! I can't imagine where the next 5-10 years will take me, based on the last few, I'll go further than I did from 97-07! which was something I had been developing in little pieces since 1999. It included a screen editor, and played much like the very first Legend of Zelda game on the NES.